Since the infancy of SFRT, when it was known as PSO (Public Service Occupations) in the 1970's under the Department of Education and Kentucky Tech within the Workforce Development Cabinet of state government, we have had some form of "fleet" to assist our training instructors in getting portable equipment and materials into the fire departments for training. Each SFRT Area (or region as known back then) had at least 1 van assigned. Nearly all were "cargo vans" with open space and 2 seats for the driver and a passenger. Some of these vans survived to serve us into the new millennium when Area 9's 1978 Chevy van, with over 270,000 miles, was traded in for a new 2000 Dodge. Area 9 still had a 1987 GMC Cargo van in service until 2006 when it was replaced with a new Ford E350 15-passenger Van. 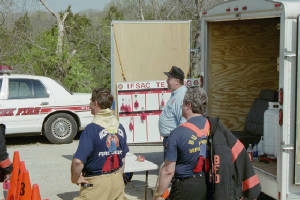 In 1997, with the assistance of the state Fleet Management and the Kentucky Fire Commission, SFRT acquired 3 new Ford F350 dually pickups and established the first 3 depots for SFRT to serve the entire state with mobile training props and equipment trailers, with the smoke maze being the largest in the fleet. These vehicles and trailers were assigned to Areas 3, 12 and 14. These areas became to be known as the "fleet depots" of SFRT, with Area 14 Coordinator Charles Shaw appointed to head up the fleet program. Since the inception of the fleet program, nearly 100% of its operational costs to provide mobile training has been funded through and by the Kentucky Fire Commission. By 2000, each of SFRT Area's had a 1-ton van assigned to its area to transport portable training equipment to its area departments to better provide a hands-on approach to training. Areas 1 and 9 were the last to receive new vans, completing the program of getting at least 1 vehicle in each area across the state. Nearly every area had at least 1 trailer, predominantly firefighter survival/rescue training prop trailers. In 2001, the three F350 trucks were replaced with F550 trucks to allow SFRT the ability to transport larger trailers and equipment across the state, such as the Flashover Simulation trailer. This improvement to the fleet graduated the 3 original depots to "Senior Depot" status and the 3 F350 trucks were kept in service and transferred to Areas 2, 7 and 9 creating 3 "junior depots". In 2002, an additional F550 truck was placed in service and assigned to Area 9 in Morehead, with Area 9's F350 going to Area 5 in Elizabethtown. Around 2004, most of the vans in the fleet were being replaced with F350 dually pickups, as the vans had difficulty pulling some of the trailers in the fleet, especially the heavy survival/rescue trailers. With the acquisition of these additional pickups, the fleet has continued to grow adding several larger trailers and props to some areas. Do to frequent need for passenger vans to assist with some special state details of the fire commission, vans have been kept in the fleet in Areas 3, 9 and 14. In 2007, SFRT was moved into the next realm of progression with its fleet through continued support from the Fire Commission. A commercial Freightliner truck was placed into service at Area 14 to move the Fire Commissions Mobile Driver Training Simulation unit safely from place to place around the state to provide state of the art training to the states firefighters and first responders. With several large heavy trailers in the fire commissions fleet, such as the flashover simulation trailer, the fleet has been further expanded to include another Freightliner truck now assigned to Area 12 and a Ford F650 truck placed in Area 9 to replace its F550 truck that has been plagued with engine and transmission problems. Estill County Fire Department. This advance fire training tool necessitated the purchase of a semi-tractor to pull the Fire Control trailer. Director Bryant Stiles located an available used vehicle and the acquisition was made. 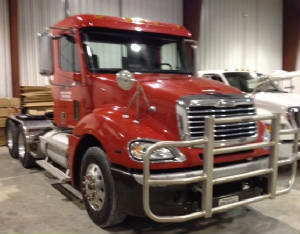 A 2007 Freightliner day-cab semi was put into service and the Area 9 office took possession of it and the Fire Control trailer. The Fire Control trailer and Freightliner semi was reassigned in 2016 to the Area 12 office in Hazard to make room for a 2019 Peterbilt tractor and 53 ft FireBlast mobile fire control training unit and car fire training prop. 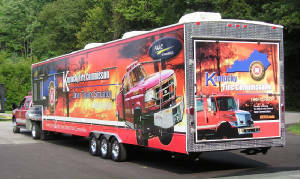 The Firefighter Survival and Rescue Trailer was funded by the Kentucky Fire Commission, each region in the state has one of these trailers. They have also funded fixed sights though out the state. The courses are also funded by the Fire Commission. They are designed for sixteen hours of instruction, and became a mandated program by the Fire Commission in the early 2000’s. Every firefighter must complete this course to be certified. The first eight hours deal with self-survival and the last eight hours incorporate skills required to “Save Our Own”. Many of the skills taught have been designed after a tragedy that has occurred and the lessons learned from such. Firefighter survival and rescue training should attempt to take that response and bring it full circle to the proactive side by training our members: first, not to get into bad situations and, second, how to get themselves and others out of them. These trailers, which take an average of twenty to thirty minutes to set-up, were built in house by our personnel. 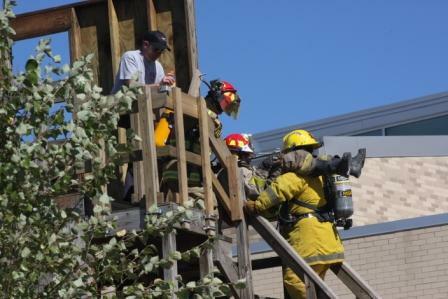 They provide the environment required to be able to deliver the Firefighter Survival and Firefighter Rescue programs. This training prop is an excellent way to insure your firefighters are prepared for any situation. Smoke Maze Trailer The Smoke Maze trailer was funded by the KY Fire Commission and was put in service in November 1996. This mobile unit enables firefighters to become more proficient in utilizing their SCBA in darkened or theatrical smoke-filled conditions. The 35' trailer is easily arranged to provide varied search situations that includes the elements of varying degrees of darkness, smoke, noise, and flashing lights. This enhanced training builds on the basic skills. It will enhance the abilities of SCBA users and prepare them for the more complex situations that they may encounter (i.e. rapid intervention team work, restricted horizontal/vertical spaces, etc.) The smoke maze trailer allows the student to increase his/her confidence of wearing and operating self-contained breathing apparatus (SCBA). The SCBA confidence course emphasizes various levels of physical stress. 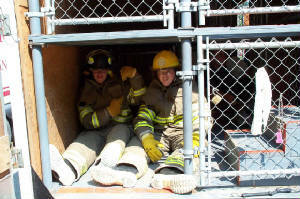 The physical exertion simulates the stress and tension that a firefighter may experience in a real situation, while searching a structure, carrying hand tools, or movement in restricted situations encountered in a burning building. Controlled breathing, teamwork, and safety when moving though scuttles, joists, stairs, and tunnels are stressed. This is one of 5 such trailers strategically across the commonwealth. Drivers Training Simulator The Drivers Training Simulator is funded by the KY Fire Commission it was put in to service in September 2006 and is housed in Campbellsville. These simulators are from FAAC Incorporated of Ann Arbor, Michigan. The KFC also funds all of the classes for this trailer which are built upon the traditional learning process of “Learn by Doing”. The 3 simulators provide training in situation awareness, risk analysis, forward/backward maneuvers, decision-making, emergency reaction and avoidance, and conscientious equipment operation through a professionally-developed library of scenarios. Two of the simulators are designed specifically to train drivers for fire apparatus including pumpers, ladder trucks, tankers, engines and other large fire suppression vehicles. The third simulator is designed to train drivers for smaller fire apparatus, grass trucks, command vehicles, private owned vehicles and other smaller emergency response vehicles. All three simulators are housed in a trailer so that training can be delivered to every fire department and community in the Commonwealth. A year-round curriculum benefits a diverse audience of new and experienced drivers representing fire, rescue, police, EMS, public works, and private industry. This tool is a positive addition to our driver training curriculum that was created to meet and exceed the driver training requirements established by the National Fire Protection Association’s apparatus driving standard NFPA 1002. According to the United States Fire Administration and the National Fire Protection Association, about 25 percent of all firefighter fatalities occur during traffic crashes. 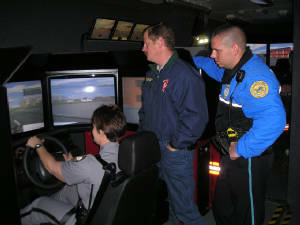 The Driver Training Simulator is designed to reduce the number of accidents involving fire tankers, which are fire trucks that can carry 3,000 or more gallons of water. Tankers are involved in more accidents than any other type of fire truck. This is particularly important in rural areas. In urban areas, firefighters rely on piping systems with hydrants to bring water to the fire. In rural areas, where there is no piped water distribution system, firefighters rely on tankers to bring water to the fire. These simulators have the ability to simulate most other types of emergency response vehicles including pumpers, ladder trucks and ambulances. 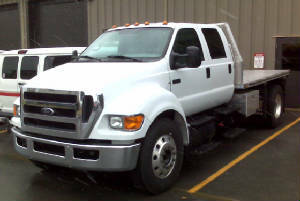 Simulator 2 & 4 which are in the front and back of the trailer produce the simulations of the larger vehicles from the F-550 or the equivalent of and larger apparatus. Simulator 3which is housed in the middle of the trailer creates the simulation of the smaller F-350 or the equivalent of and smaller to private owned vehicles, command vehicles, chief cars. The Fire Driver Training Simulators are a part of the FAAC Public Safety Suite, which provides simulation-based training tools for first responders including fire, EMS and law enforcement. 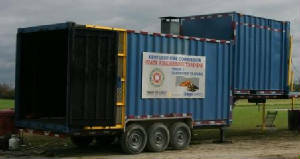 The Flashover Chamber is funded by the KY Fire Commission and was put in to service in June of 2000. The flashover chamber is one of two State Fire/Rescue mobile flashover training props, which can be found in the Commonwealth, one to the east of I-75 that runs through the state and one to the west of I-75. These units, which were built by Swede Survival Systems, are the first of their kind. The Phase 1 – Flashover class motto is “TRAIN TO LIVE”. 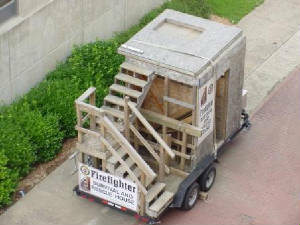 The 30' mobile prop helps the instructors to train firefighters to recognize when a room or other burning structure is about to completely combust, it gives them the opportunity to observe fire behavior, see warning signs associated with a potential flashover, and use various techniques that may save someone’s life. A very high percent of firefighters who die in a fire, die from a flashover. 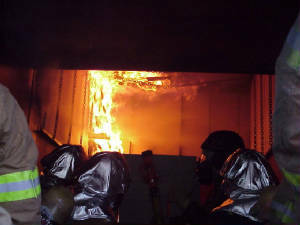 The flashover chamber allows the instructors the ability to train firefighters to recognize the warning signs that a flashover is about to begin. Training is the best way to avoid some of those dangerous situations and conditions. If a firefighter is able to see those warning signs, then they are able to get out before the situation worsens. 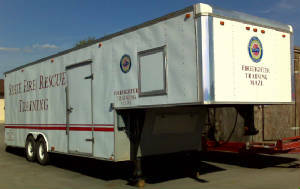 Our 2nd firefighter testing trailer was placed into service in 1999 to transport equipment needed for certification testing that may not be available at the remote site of testing. This trailer carries most equipment the would be found on any fire apparatus, plus pump testing, wildland, accountability, extrication and simulation equipment. The equipment on this unit is solely reserved for testing purposes so it is not used in training activities not directly related to preparing firefighters for certification testing. This unit has since been replaced with a 2015 High-Top cargo trailer. The fire control tactics trailer was placed into service in 2012 through a cooperative measure with the Estill County Fire Department. Estill County had acquired the unit through a USFA Fire Act Grant for fire training. Estill approached the fire commission with a plan to share the unit statewide in advanced firefighter training. Through a cooperative agreement, the fire commission took possession of the propane-fueled training unit and it travels the state frequently involved in regional fire school training classes and firefighter certification testing. The trailer is computer controlled, fueled by an onboard propane supply using clean-burn technology without the need of combustible materials. Scenarios include evolutions in basement/cellar fires, grade level and above grade level structure fires, rescue, kitchen and bedroom fires. In 2015, the fire commission acquired 3 FireFlash fire control trailers from FireBlast, Inc. 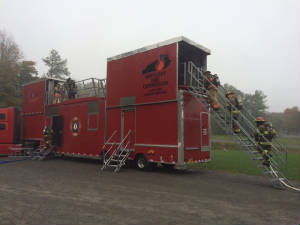 These multi-facited training trailers provide state of the art technology to simulate above, below and at-grade structural firefighting including room and content fires, appliance fires and ceiling roll-over fire scenarios using LP gas instead of combustible materials creating a much safer environment to train firefighters.